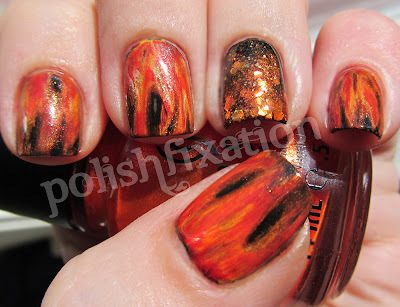 polish fixation: Nails on Fire! 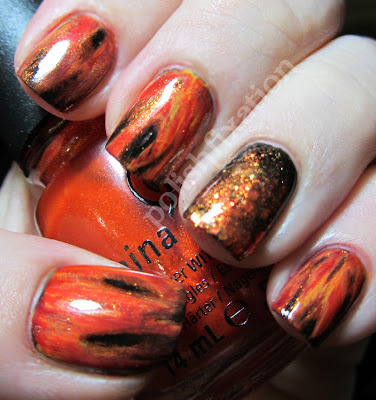 So last week my good friend Jamie posted an awesome tutorial on her blog, Nails Adored. 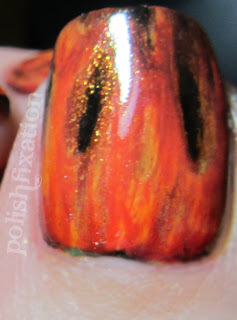 The tutorial was intended to achieve a "grunge effect" on the nail, and the nails she did with it are just incredible. 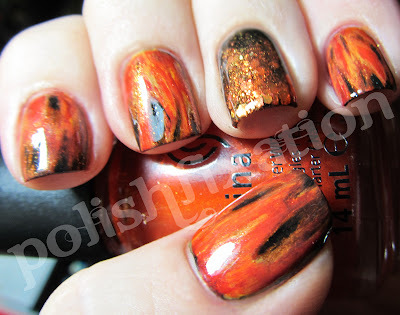 You have to go see them: http://www.nailsadored.com/2012/03/23/grunge-effect-tutorial/. So anyway, I thought this tutorial could be used also to get a fire-like effect on the nail too, so that is what I used it for...since this past weekend was Hunger Games release weekend and all, it seemed fitting! 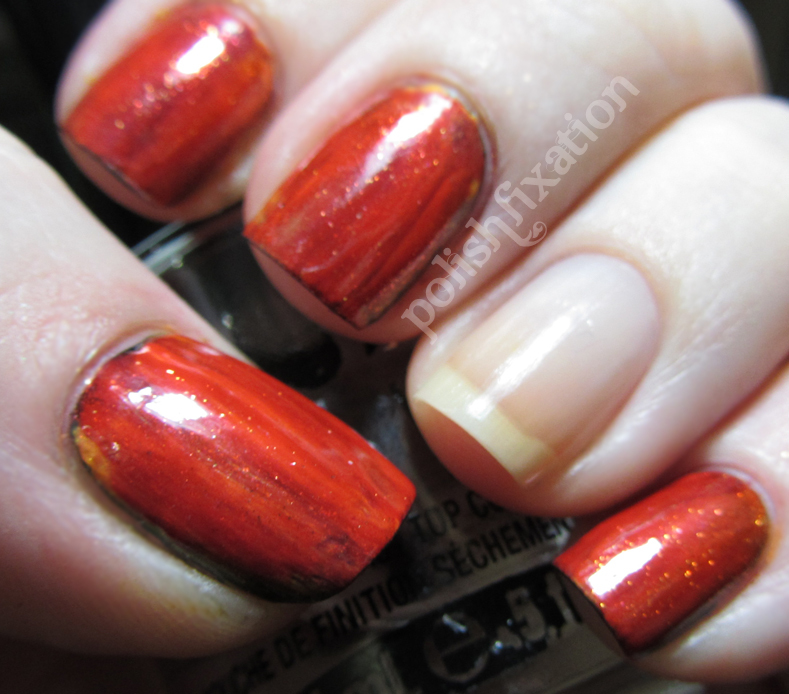 Nails, BEFORE the last step, and before adding accent nail. Up there you'll see what my nails looked like after I had done all steps of the tutorial except for the last, most important, step of using a brush dipped in acetone and carefully making strokes across the nail to remove some of the layers of polish to reveal the black underneath in certain spots. I absolutely love how this came out! I am soooo happy I decided to use the tutorial, it wasn't even hard at all, even for someone like me who rarely does nail art other than stamping or splattering. After I did the tutorial nails, I added the accent nails. Those are done with the same black base as the rest of the nails started off with, and then I mixed together Nerd Lacquer's Regeneration and China Glaze Riveting, and then sponged that mixture onto the two accent nails. 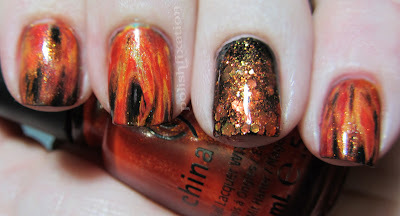 Wow, incredible and super creative way to make flames! Jamie is rad, and you did a good job too! Wow.. these are amazing.. great job!! Well done! I am about 3/4 of the way though the first book ( late to the party, I know) and I hope to see the movie next week. I think I will try this!! Love these! So super cool! I wanna try! I am seeing the movie on Wednesday! nice! 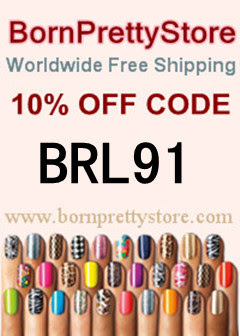 i love the accent nail, but i love the whole mani also!